Light: Taking appropriate action. Receiving guidance from a higher power. Becoming a channel of divine will. Expressing masculine energy in appropriate and constructive ways. Being yourself in every way. Shadow: Inflating your own ego. Abusing talents. Manipulating or deceiving others. Being too aggressive. Using cheap illusions to dazzle others. Refusing to invest the time and effort needed to master your craft. Taking shortcuts. Mythical/Spiritual: Thoth, the Egyptian god of wisdom, known to the Greeks as Hermes and to the Romans as Mercury. Christ working miracles. Brahma, the Creator. Story: Consciously or unconsciously, the main character receives or controls a resource that holds the key to the story’s primary challenge. Relationships. A relationship should empower you. Does yours generate positive change in your life? Do you feel happier and more fulfilled? A relationship that supports your goals is to be valued; a relationship that doesn’t must be changed or cast aside. Work. Exercise whatever authority you have. With the right resources, you’ll succeed. But not everyone who appears empowered really is. With an eye toward growth, seek allies who focus on steak, not sizzle. Be a mentor … or find one. Deploy tools and resources against well-defined goals. Spirituality. If others were to see you and your life as an expression of the Divine, what would their impression of the Divine be? How can you improve that perception? How can you better dedicate yourself to being a channel for positive energy in the world? Personal Growth. Asserting yourself can be an important step toward wholeness. When your work or life experience has given you special insights or talents, shrug off self-doubt and apply them fearlessly. Act confidently, and feelings of confidence will follow. Fortune Telling. A powerful man may play a role in your day. Your current situation must be seen as one element of a much larger plan. The lemniscate. Symbolic of infinity and spiritual mastery, the lemniscate floats above the Magician’s head; some also see it reflected in the oddly shaped brim of the Marseilles’ Juggler’s hat. How would access to infinite power change your situation? What would you do? The Magician’s tools. 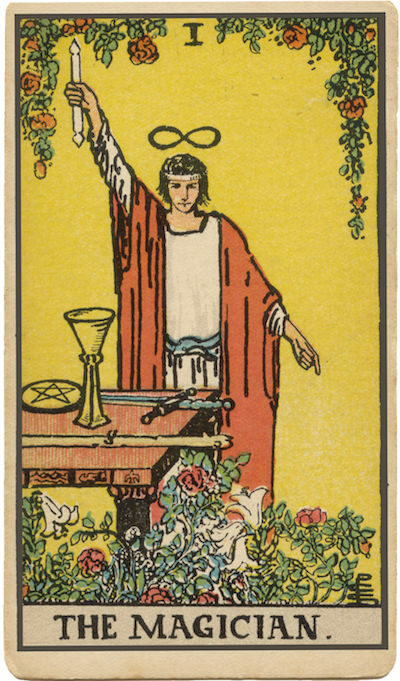 Very early decks depict the juggler with a wand, cups and balls, and a knife—tools of a common conjurer. Some later decks change these to a cup, a blade, a pentacle, and a wand, suggesting mastery over the four dimensions of life. Contemporary decks may use other symbols to suggest similar themes and additional alternatives for action. Which tool do you need today? The upraised wand. The Magician often holds aloft a wand or caduceus (the snake-entwined symbol associated with the god Hermes and the medical profession). He channels the power of heaven to bring about change on earth: “As above, so below!” What might heaven channel through you? Magician’s clothing. The Magician’s robe suggests masculine empowerment. He might also wear a belt fashioned like an oroborous (a snake swallowing its own tail, suggesting constant reinvention). How might direct action or reinvention aid you? Roses and lilies. The flowers at the foot of the RWS Magician suggest the unification of the masculine and feminine, associated with the alchemist’s goal of spiritual refinement and perfection. Which approach takes best advantage of both your masculine and feminine perspectives? What am I empowered to do? How might my abilities come into play? To what extent am I making the most of my talents?